Every three months or so a few of us in the neighbourhood get together to try a few drams of whisky. While predominantly blokes, there are now few brave women joining the fold of what has become affectionately known as the Renfrew Whisky Appreciation Society. Having been established just 12 months ago, the numbers have grown, from just half a dozen, to near on fifty members. It used to be the rule that we would all bring along our favourite dram and we would all try it, as you can imagine, with large numbers like this, you’d struggle to get through every whisky in one night, let alone have any notion of what they tasted like. As the numbers have grown we adapted the rules, so now we tip in $60 each and then buy a dozen or so bottles to try. Whiskey and More, with a huge array of single malts available online (www.whiskyandmore.co.nz), very kindly helped us with our selection and also gave us a very good deal. Part of our mission on the night was to compare 12 year old whiskies to the 18 year old whiskies from the same distilleries. We were pretty much unanimous in choosing the 18 year olds over the 12 year olds (even in blind tastings). The age refers to the time spent in the barrel, rather than time spent in the bottle as with wines. Unlike wine, whisky won’t develop any significant change in the bottle as long as it isn’t subjected to extreme elements. The longer it is kept in the barrel, however, the more flavour that is derived from the barrel itself. The wood (generally oak because of it’s porosity) plays a large part, but also the charring of the oak and the previous uses of the barrel, like ageing bourbon or maturation of wine, sherry or port, play a pivotal role. Before being aged in barrels the raw whisky, made predominantly from malted barley, is a relatively clear liquid with very few distinctive characteristics. It is the barrel ageing that imparts a large part of the flavours and colour. Traditionally distillers would use sherry barrels but with less people drinking sherry these have become harder to source, so bourbon barrels are more commonly used, with port barrels and many whisky distillers using wine barrels in the aging process too. The older the whisky doesn’t alway mean the better it tastes though. There are whiskies around that have been in the barrel for decades. While these are very rare, they also get to a stage where they become less palatable and start to derive too much of the flavours from the wood itself. From the dozen whiskies we tried on the night, here are some of those that we collectively decided were the best of that selection. This isn’t the first time that a Glendronach has made our list. In November last year (see M2 November issue) I mistakenly referred to the GlenDronach as a Speyside whisky. While it is close to the Speyside area and, like many Speyside whiskies, they use a lot of sherry casks in their ageing, it is in fact a Highland Whisky (don’t make this mistake or you have the wrath of the scottish highlands upon you and ‘na bi fearg air neach’ (don’t anger a scotsman). The GlenDronach is named after the source of the water they use – from the Dronach Burn, situated in the north-east of Scotland in the Forgue valley in Aberdeenshire. Founded in 1826, Glendronach has a history of enterprising owners, from James Allardice (its founder) to Walter Scott. In more recent years it has been owned by the Grant Family, William Teacher, the Chivas brothers and after being bought by Allied Domecq it even spent a few years (1996 to 2002) in moth balls, until it was thankfully resurrected again after Pernod Ricard purchased Allied Domecq. 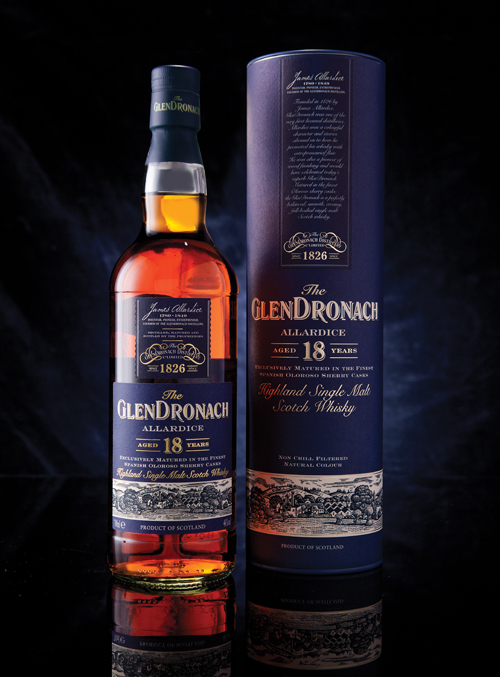 The Glendronach 18-year-old ‘Alldrice’ is matured in Spanish Oloroso sherry casks, to produce the deep gold colour, delivering sweet aromatics of fudge and glazed cherries.The palate is silky smooth with soft spicey fruits and walnuts combined with a chocolate orange flavour (almost reminiscent of a Jaffa) with a lovely lasting finish. Caol Ila (gaelic for ‘the Sound of the Islay’) was one of two Islay malt in our selection- one of just a handful of distilleries on isle of Islay. It’s the Islay malts that usually have that very strong peaty aroma that brings to mind the smell of hot tar on a warm sunny day. Isla malts tend to be quite polarising where people either love them or hate them. Personally Islay malts are among my favourites, I just love the intensity of the flavours and the Caol Ila 18 year old, as it turned out was certainly one that appealed to most of our team. Established in 1846 by Hector Henderson after many changes in ownership and a couple of liquidations, it is now in the hands of Diageo. Apparently the bulk of their production goes into Diageo’s Johnnie Walker blends with only around 5% being kept for maturation within the Caol Ila single malt range. The water for the still runs through peat and limestone but it is in the production of the malt where they burn peat that these whiskies get the bulk of their distinctive ‘peaty’ flavors, with the barley being exposed to the smoky peat during drying. Caol Ila is considered to be one of the lighter Islay malts, however the 18 year old still has that distinctive smokeiness of an Islay malt without extreme levels of peat. With the phenols toned down a bit, a natural earthy herbaceousness come through on the nose, with a refined sweetness and tones of vanilla, liquorice and pineapple on the palate. The finish is long lasting and slightly smoky. The town of Bowmore is the capital of Islay on the southeastern shore of Loch Indaal. 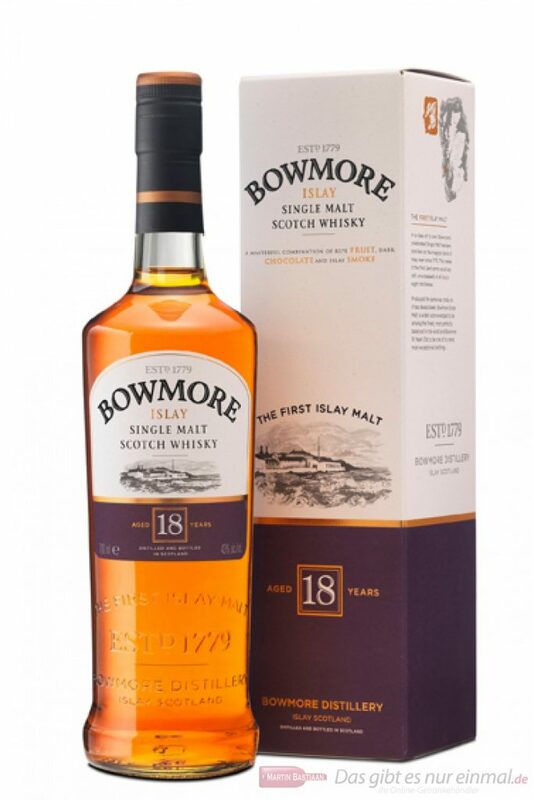 Bowmare is the oldest distillery on the Isle, said to have been established in 1779 by a man named John Simpson. The distillery has been part owned by Japanese beer giant Santory since the early 80’s. Producing just 2 million litres a year they apply strict tradition with their production methods barely changing over two centuries of operation, yet they still manage to be the second best-selling whisky on the Island after leviathan LaPhroaig. Having taken out the took out “Best in show” at the world leading San Francisco drinks competition, where it also receiving double gold in a blind tasting (from the youngest to the oldest)of all scotch whiskies, the Bowman 18 year old is a stand out whisky in our selection. Matured in both Oloroso and Pedro Ximenéz sherry casks the whisky delivers a slightly citrusy aromas on the nose with slight hints of peat. The palate is lovely and sweet with notes of plum with a finish of dark peat and marmalade. Now owned by Chivas brothers, a subsidiary of Pernod Ricard, the distillery is one of the biggest with a capacity to produce 10.2 million litres per annum and is the world’s second largest selling single malt and the number one selling single malt in the US. Matured in Oloroso sherry casks from Spain, the nose is rich with aromas of fruit, nuts and rich chocolate (think picnic bars) with hints of cinnamon, anise and vanilla. The dark chocolate notes are quite distinct on the palate with hints of orange and fresh crunchy apples while the dark chocolate and spicy notes carry through on the finish.